In January 2018, I mentioned on Twitter that I had tasted a rather unpleasant example of the new or newish Irish gins. This attracted quite a lot of attention and it seems that I’m not alone in thinking that there are more than a few Emperor’s New Gins out there. I was encouraged to name and shame but I chose not to. Listing bad products is time wasted. Mentioning good ones feels better to me. And so, here’s a piece I wrote last year in the Irish Mail on Sunday mentioning some of my top Irish gins. I should add that I have enjoyed in the meantime Listoke, from County Louth, Hepple from the north of England and The Botanist from the Isle of Islay. Have we reached peak gin? It seems these days that, if you were so irresponsible as to throw a brick in a public place, you would hit a new “artisan” or “craft” gin. Or possibly both. How times change. Gin used to be fogeyish. Now it’s full-blown hipster. In Ireland, this owes a lot to the renaissance of our native whiskey. The owners of the plethora of new whiskey distilleries knew, at the very start, that gin could be a cash cow while the other stuff spent its minimum of three years maturing before it’s legally entitled to the name. The first came from the Dingle Whiskey Distillery and was followed by many more, some great, some indifferent and some awful. Bear in mind that some gins are nothing more than flavoured vodka. I should add that I tasted a sample last year from quite a respectable source – London dry, although not stated - and my tasting note was “aroma of old lady’s handbag”. And I didn’t mean that in a good way. But doubtless there are people who would love it. London dry gin doesn’t have to come from London but is a legally defined kind of gin. It’s distilled from ethanol in the presence of botanicals. Nothing at all can be added after distillation apart from water to adjust the alcoholic strength. The best new gins are virtually all London dry, whether they say so or not. Interestingly, Hendricks is not, and this is because they have to add rose and cucumber essences to get that distinctive flavour. Much is down to personal taste, of course. I find Hendrick’s insufficiently gin-like, in that it doesn’t have a proper whack of juniper as proper gin should. Indeed some of the craft gins I’ve tasted don’t taste remotely like the real thing. This is our “house gin” and it’s simply lovely. Made by Blackwater and offering astonishing value for money it was named Best Gin in Ireland last year (before anyone knew that it was an Aldi exclusive). It has all the gin essentials in my book: juniper, citrus, coriander. But it goes further and as you savour it other elements appear: a fruitiness with a touch of sweetness, rose hip, elderflower and blackcurrant. The final intriguing spiciness comes from (I think) pink peppercorns. This is probably my desert island gin in that it ticks all of the boxes for me. It has a proper juniper character but not enough to shout down the other, much more subtle flavours and aromas such as bergamot orange, citrus zest, herbs, even a whiff of something like lavender. It’s also very dry and this emphasises, for me, its elegance, almost a delicacy. Wonderfully complex, it reveals layer after layer of flavours on the palate if you don’t destroy it with tonic water. One of the best value small batch gins on the market and one that has evolved beautifully over the past few years in terms of the formulation. Lovely up-front juniper character with plenty of citrus zing, plus intriguing notes from stuff like local bog myrtle, hawthorn and even fuchsia. The leafy, green, fresh notes with a touch of aniseed may well come from the chervil. All in all a deliciously complete gin, traditional, four square, yet with some intriguing twists. In other words, typical of the thinking of those at the Dingle Distillery. The bottle is rather cool while the label is perhaps a bit naff, but don’t be put off. This is actually a very subtle gin and it has definite body. It does have juniper and the usual suspects but the use of rhubarb and (I’m guessing) black pepper and vanilla creates a very unusual and, in my book, quite delicious gin. Vaguely reminiscent of rhubarb and custard, but quite dry and broad on the palate, warmly spicy yet tart on the finish. Definitely not another “me too” of which we have seen far too many. This is made two people whom I once taught, in my youth, at St Columba’s in Rathfarnham, Justin Greene (now a neighbour) and Anthony Jackson. 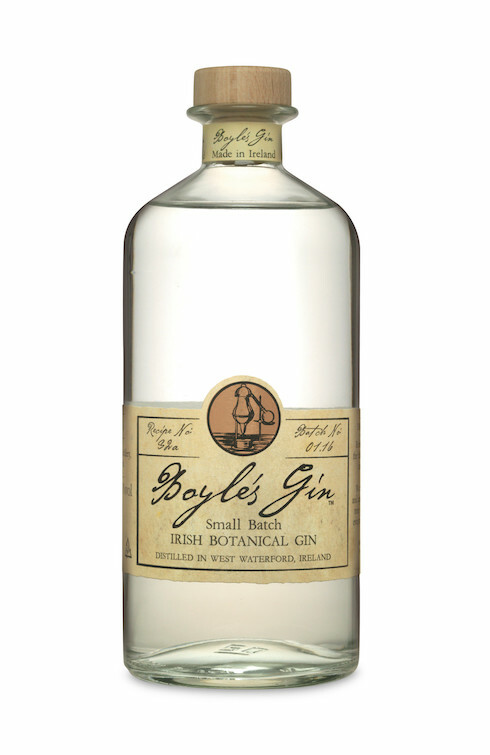 Made at Ballyvolane House near Fermoy, it makes a point of being based on alcohol distilled from whey (and it’s not the only gin in this bunch today to use this as base spirit but it's the only one to claim it). Since its launch the very potent cumin character seems to have been dialled down a bit and the citrus is getting through. If this were a wine I’d describe it as “big”. Certainly different. A delightfully distinctive gin that stands out, like all of this week’s selection, from the burgeoning crowd. I’m amused to see that a certain supermarket group has copied the equally distinctive packaging for their own very inferior product. Citrus first, then the juniper burst but after that it gets very complex and there’s a heavenly honeyed scent that I’m guessing comes from meadowsweet, one of my favourite wild flowers. The gunpowder refers to gunpowder green tea which may or may not be detectable. It's not a tea with which I'm properly familiar. It doesn’t matter.